I think this was the first poem I ever memorised for my own pleasure. I like to memorise poems so that I can carry them with me, and recite them to myself in my head if I am on a train, in a waiting room or on the metro. This particular poem mesmerises me with its music and its wistful romance. Apparently, Yeats wrote this poem for Maud Gonne after she refused his proposal of marriage. He creates a beautiful fantasy of their being transformed into white birds — symbols of innocence and freedom — and flying to where “Time” and “Sorrow” would no longer haunt them. You can feel his desire to escape his circumstances, to escape society, pressures, everything that is keeping them apart. My favourite phrases are, “hung low on the rim of the sky” and “hung low on the fall of the dew” – that repetition is just so melodious. The image of the the lily and rose, described so beautifully as “dew-dabbled” dreamers, is evocative of the ephemeral nature of every living thing, and, perhaps, of the couple’s love. 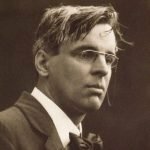 Yeats urges his beloved to “dream not of them”, because he wants their love to be free of the fate of those flowers. He wants an evergreen love, one that will not wilt and die. But I think that by recreating himself and the woman he loves as white birds, “buoyed out on the foam of the sea” — through this poem — he has already made their love eternal. He has transformed them into art, which never dies. This is a beautiful poem. I love it. Do you know any other poems that touch on the same theme? One that touches on the idea of eternal love free from the restraints of this life?